I need you experts input on how to move from arcades to pins. I grew up playing vids and pins were rare around me so I never got into them growing up. But recently I have gotten bored playing vids and started playing pins more when I get the chance to. So I decided to add a few pins to my collection of vids. Sold my TMNT and NFL Blitz 99 and going to end up selling my Mortal Kombat 2 so I will have roughly $4000 to spend. I do have a Mr and Mrs Pac-Man pin that i picked up non working and have not even looked at yet but other then that i have no pins and the game looks boring to me. My wife hates pins and says stick with all vids but it’s my collection so my choice BUT whatever I get the title has to be decent for her to be accepting and my kids have to want to play it so I’m thinking maybe like revenge from mars? Now for opinions, I LOVED ghostbusters when I played it and think I should find a used pro for around my price range or should I find 2 older decent pins for the same money? Fish tales priced around $2500-3000? Like police force or getaway or something? Locally I think some I found are decent priced? I know I’m all over the place but I’m torn Ghostbusters or 2 lesser priced fun pins to start? And if lesser titles what to keep the wife and kids happy? If you played and loved GB then get that one. It's a fun game. I started with arcade games and moved to pins! It’s a very expensive and exciting hobby. Also a very heavy hobby. I would suggest buying 1 or 2 entry level pins to start. You can always play for a while, then trade up when you’re ready. You should visit a spot with a lot of pins and get your hands on each one to see what you like and don’t like. My wife loves our Star Trek pro and Indiana Jones. Have fun!! Not GB!!! Brutal game for newbies. SP may be a bit too much if your kids are young (adult mode should always be on that game). Taxi would be great but doesn't have that "wow" factor your kids may want. I'd say FT and JP are your two best choices for family pins, perhaps NF if the talking skull isn't scary to the kids. If you're considering newer Sterns, there's a slew of superhero and family pins that come into range at $4K (SM, XM Pro, TF Pro, POTC...etc.) that would be a lot better than GB IMO. Edit: Also WCS went over very well with the family. We currently have ST Pro and SM for the family pins. Even something like Batman Forever or Avatar and those two games shoot entirely different. Basically get out there and play a bunch of stuff before dropping $2-4K and lugging 250+lbs around. I too made the jump from vids to pins altough I went through some older pins before I got hooked on newer models. Ghostbusters was my first NIB pin and now I will only buy NIB or HUO ... GB Pro model is an excellent game. Fantastic theme, art, sound and plenty objectives on the play-filed. I say its a great candidate for your first pin. especially if you have already played and loved it. start on the cheaper end and go up. any sega, data east or cheaper Williams like the getaway, fishtales, taxi, t2, any system 11 would all make great starter games. learn about them and then you can upgrade to a gb, etc. Good advice Scott. I would add that you should buy something ranked in the top 150 on Pinside. There are a lot of titles $3k or less. These titles are much easier to sell or trade down the line. Look at Pinside’s top 100 list of pins and watch some videos of game play. Make some notes on what interests you. Show your wife some possible pins you’d buy and get her buyin. Louisville arcade expo in March would be a great place to start. I say bring the family down there for the weekend. So much stuff will be there to try out. And a lot will be for sale. I think your instincts are right on the money. Take your $4k and start with 2 cheaper but still popular pins. All the titles you mentioned are good options except maybe South Park. That pin is funny but gets old fast and the call outs may not fit your kid-friendly criteria. I started with cheaper pins like Taxi and Haunted House and eventually moved up to modern DMDs. If you have $4000 and are going to stick with a 1 pin collection I would go Stern pro. All the games you listed will get old quickly with the exception of GB. I like Taxi, Fish tales, and JP, but they will not stand the test of time IMO. I owned both FT and JP and they each made it about 6 months. I bought a Star Trek pro and a MET pro for $4200 each and they are both fantastic. I still have MET pro 2 years later and only sold star trek to get a premium. I have a High Speed for 1600 in the marketplace. I would also be interested in Mr/Ms pac if you are not planning to revive it. If you want to try out games here, shoot me a PM. I realize you are probably better off sticking to the Chi area since it's much closer and there are a ton of places to play up there along with leagues and a bunch of collectors. Also, the Midwest Gaming Classic is in Milwaukee in April if you want to check out another show. Thanks everyone for the advice, I have money burning a hole in my pocket and really want a pin but I need to slow down and see what pops up over the next month or 2. I am thinking either get the ghostbusters or another newer stern or leaning more towards getting either a Revenge from Mars or Jurassic Park then adding another $1500 game. I think those 2 titles will appease the family aspect and get them hooked on pins. RFM I think would be an easy transition from vids to pins for the kids with the video on it so that may be the best route to take. But JP looks more in depth to keep me coming back for more on it. But damn the pretty lights and fast play of the new sterns keep popping in my mind. I know it might be hard to do, but my advice would probably be to get one cheaper pin first and see how you like actually owning it. When I first got into pins, there was a decent learning curve and ALOT of trouble shooting (why doesn't this switch work, why are these lights out, why is this flipper suddenly weak, why do my drops not reset all the time, etc.). This probably applies a lot less if you are buying something very new and/or well maintained, but I'm glad I ended up easing in and making sure I didn't over commit and actually liked working on them before going in on more since stuff can and will go wrong. It's hard not to buy everything in sight, but I've been glad I've waited until deals came across and was able to learn alot as I went. I've now got a growing collection I built up (relatively) cheap and learned a ton and gained a lot of confidence in the process. There will always be games available, so I'd be patient and ease in and enjoy! Imo, two lesser priced but fun titles will be better than 1 more expensive game. If you don't mind making a little drive, there is a league that plays on Thursday nights in Schererville. You can play a few games to get an idea of what you might prefer. You're also welcome to come over and play whatever games I currently have at my house. My advice...condition is everything! From playing it to reselling it. Find other collectors who treat their games well and pay the extra few bucks for a better condition game. Don’t start with projects or a rougher game just cause it’s a little cheaper. Find a game that you enjoy playing and like the theme, and get the nicest copy you can. I can tell you that having one game is just not the same as 2 or 3 and that when you hit 4 it starts to play and feel like a collection. Everyone starts with one but in my opinion there is no si gle pin that would keep me interested- get 2 or three decent games and I feel like you will get more enjoyment out of it than owning one supposedly stellar game. I get to play a few of the very highest rated games in the top 100 with regularity in friends collections- and some older good ones in mine- and neither of us think it would be fun to have just one game. It simply gets boring playing the same game all the time. 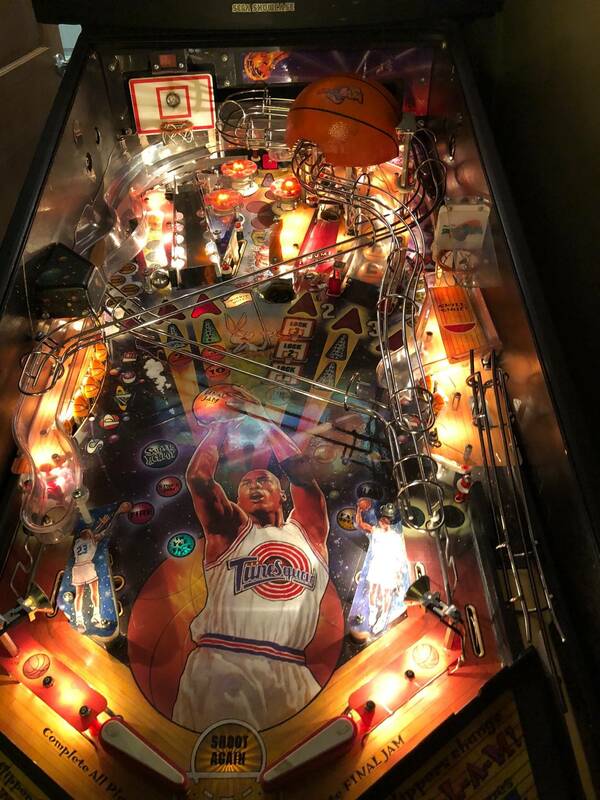 Maybe its just me- but pinball is fun because every game you play varies a bit even if you olay the same game (this is good) and this keeps it interesting for sure, but different games add a huge variety on top of that. Also- Jurassic Park is an excellent choice—- dont own one but seriously considering making room for one. I have kids too and they would love that game. Even my wife would watch a game or two! Do you know the details on this show? Dates or location? Grab the 1700 taxi! Great starting point. Those are great prices on Taxi and NF, which are both very fun games. Go for it! I'll second the Taxi. Bought one day before Thanksgiving, was played all day on Thanksgiving by young and old alike. Good thing it was in working order! I'd also agree with 2 fun pins over 1 expensive pin. You'll be happy with whatever you get for months, so start slow, with variety, and figure out what you like. I agree with the 2 games to start. You can’t go wrong with either FT or Taxi, both of these imo keep you coming back. And if you get bored very easy to move them. I started with an expensive one thinking i’d only have one game. As a vid collector you know this is a ridiculous notion. Any single game collection will eventually get old. There are a lot of choices and things to consider. Older games will require work to mantain so if you enjoy that aspect, older games might be a good start. On the other hand, they are not nearly as flashy as some of the newer games so kids may get bored quick. Since you sound new to pin ownership and want to get the wife and kids involved, I would suggest Dialed In. My daughter and her friends have a blast playing it and go nuts when it starts snapping photos or emojis start popping up. Its a great game, built very solid and fun for everyone. My wife, who does not typically play pinball has really enjoyed playing it as well. Good luck and I hope you find a great game you all enjoy. I wish I could afford a Dialed in but the wife Sees pin prices and says no way. I’m selling some vids to buy the first real pin. I bought every one of my vids non working and repaired and restored all of them. Tinkering is more fun then actually playing sometimes so I definitely will own a couple older pins at some point down the road. I have a few RFM and JP that I have found so I decided to start with one of those and my Pac-Man pin then save for the other title over the next few months. buy one that is working, not a project. Like your idea of a few system 11/ WPC. I’d have them play GB for some time on location if you have not done so. The theme GB is great, owned one, but rest of family found ball times and modes frustrating over time and prefer others they can better handle with more consistent enjoyment. Maybe your experience will be totally different - good luck with your search! Having owned several WPCs, JJPs and Sterns, I would say overwhelmingly that WPC dmd games are the easiest to learn on, parts are readily available . There are a couple titles that have very unusual special parts that are critical to the game, but the vast majority share most parts. And there’s only a very few stinkers, so you almost can’t go wrong! Buy from a local collector who has tuned the machine. Even if fully working there can be issues to work out so projects can become overwhelming as a first pin and just sit for months or more. Better to pay more for a 100% fully working game to ease you into the hobby than to save $ and get frustrated. I would wait till you found a good deal on GB. I have to +1 for World Cup Soccer. I'm not a soccer fan by any means but that game is great. So many fun shots. It's an instant hit with my kids and I haven't even shopped mine out yet. Something to consider. Buy a non working one! After about 2 weeks of working on it your wife might say "I'm going light 30 one hundred dollar bills on fire!" Lots of great pins for 4000 or less. It helps to get out and play pins. The more the better. Some of my fav pins are ones I had little interest in until playing. Sometimes it is the opposite. Think I am really going to like a pin but not so much after playing a bunch of games. GB is an example of that. Looks awesome and packed with features but gameplay soured over time. It also helps to learn pricing so you don't get ripped off. Condition is very important and some problems that seem huge are easy to fix. Out of what you mentioned, look for a Taxi. Not too complicated, no intricate toys, just fast and fun with some deceptively challenging shots, and the spinout skillshot is still one of my favorites. Reproduced ramps are available if they're shot on one you find. Bargaining down $200 will pay for it. Getaway is another solid choice. Or maybe even the classic High Speed can be had for less, perhaps leaving the possibility of another purchase. Also not a whole lot of complicated breaky stuff in comparison to what you could have. There is a ROM version for tournament play that disables the progressive jackpot, which has little point in a HUO environment and unbalances scoring. Out of pins I could feasibly own in the foreseeable future, HS probably tops my list. My childhood and a piece of pinball history, all in the same cabinet. Just an update to the thread. Yesterday I picked up my first real pin and have been playing it all day. 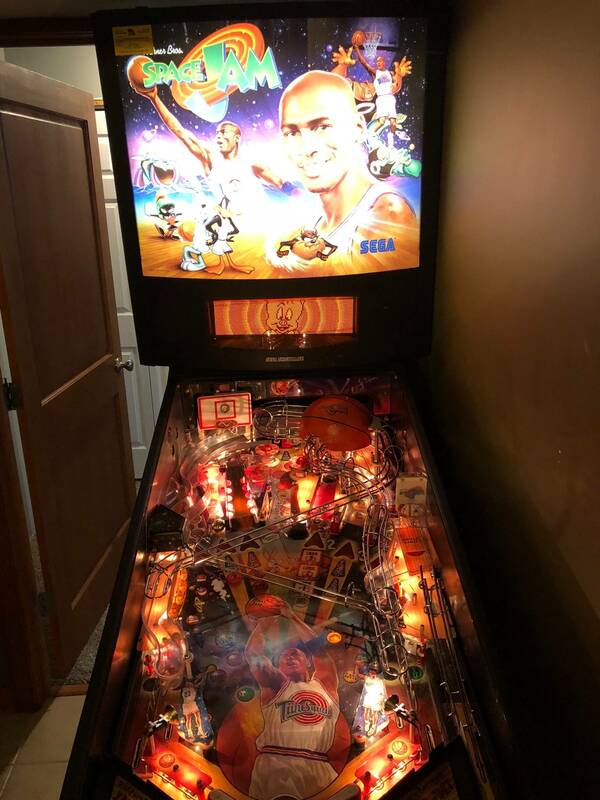 It’s not the greatest title but for $700 I could not pass up a fully working and decent condition Space Jam! My kids love it with all the feel good easier shots and multi ball is so easy to get. I’m getting into figuring out how to shoot each type of shot and it’s honestly a challenge to try and complete each challenge in the allotted time. I know I stole this game for $700, ordered new rubbers, playfield cleaner and flipper rebuild kit. Trying to research LED now for it. Also found a few RFM and JP locally so within the next 2 weeks I will have 2 pins and then I plan on just saving for a used newer stern like I wanted. 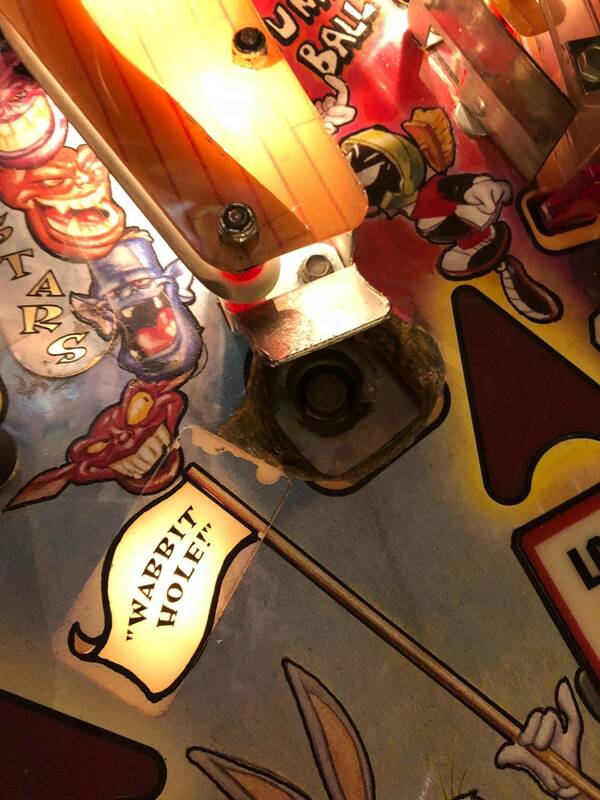 Playfield is very dirty and rubbers are tired, only real bad spot is the wabbit hole is worn around it and wear around the flipper buttons but other then that it is in pretty good shape.